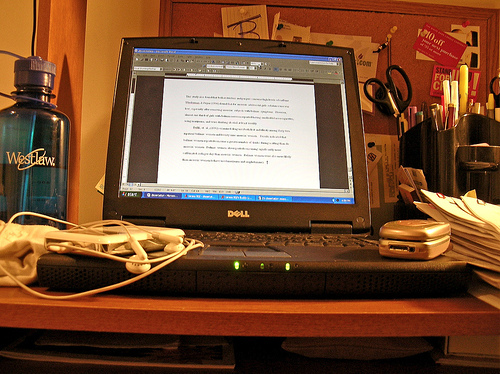 Last year, I wrote an article entitled, "Writing The Dissertation One Blog At A Time." Unfortunately, the idea never materialized into anything tangible. In the silence of my head, I let the perceived risks of writing the dissertation publicly stop me from ever starting. What if someone steals my research ideas? What if I write publicly and the plagiarism scan finds my articles online? What issues would that introduce? What if? What if? What if? I know, I talked myself out of a good thing, huh? That point was further driven home last week after I found Roger Parker's article entitled, "Introducing an Even Easier Way to Write Your Book," where he talks about blogging as a valuable tool for writing books. While the author is clearly talking about books, I choose to replace "books" with something just as daunting, the dissertation. Feedback. In addition to the power of a blog to attract a publisher’s attention, writing a book as a series of blog posts makes it easy to attract feedback from prospective readers. By sharing your ideas as soon as possible, and encouraging reader feedback, you’ll find out whether or not you’re providing the information your market wants and is willing to pay for. Promotion. Writing your book as a series of blog posts builds anticipation for your book. Each blogpost not only enhances your online search engine visibility, but it also establishes familiarity and trust that helps ensure the successful launch of your book. The most important reason to start writing your book as a series of blog posts, however, is that it’s an easy way to make your ideas tangible…to get your ideas down on paper as quickly and painlessly as possible, so you and your editors can make them better. It’s impossible to improve something that hasn’t been written! In hindsight, I did extremely well with my course work because it was small and easily manageable. Completing 1,400 to 3,500 word papers once a week was challenging, but not impossible. Looking at the size of this dissertation, I froze. After a year without producing something tangible, I think its time to reignite my engines and get the ball rolling. As my frat brother, Joseph Long, aptly stated, "Aint nuthin to it but to do it!" I agree. As a refresher, here is my plan for writing the dissertation one blog at a time. The first step is to continue reading journal articles, books, and other literature to develop my ideas. As I read, I will incorporate my thoughts and ideas into blog posts that focus on different elements of my study. Because I have a tendency to time box my day, completing smaller papers on a daily basis makes the 'elephant' easier to swallow. Blog posts will house my most current and relevant thoughts on organizational commitment in the non-profit organization. Individuals who share a passion for the topic may chime in and offer additional reading or perspectives that I haven't considered. Hopefully, this engagement will aid in a deeper analysis and comprehensive report. Finally, I can take advantage of Blogger's site search to identify information and resources as the need arises. Not only will I have my own thoughts, but I would also have at my disposal the collective intelligence of others. What do you think? Am I missing something? Is there something I'm not considering? Is this a risky proposition? Is it worth doing? Has anyone written a dissertation successfully in this manner? I would love to read your feedback on this idea. Let's talk about it in the comment section below.